When you’re idling bang in the middle of India’s longest lake, you may drift off to sleep in the middle of a conversation. As a gentle breeze plays over the placid watery expanse, your eyes droop, your words slur, and before you know it, you’re snoring gently. 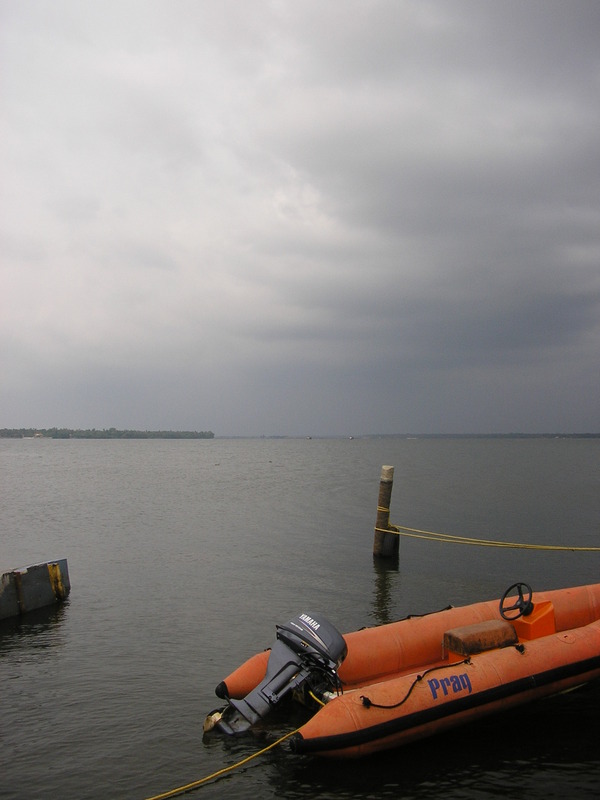 At over 250 sq km, Vembanad Kayal is a massive freshwater lake on the south-west coast of Kerala. Large enough to border three districts, it is at the western edge of the extended backwaters system that covers almost half the state. Its emerald green waters stretch to the horizon under a low sky fringed with clouds. Small, insistent waves lap the shore with lazy inevitability, as the summer sun climbs the sky, painting the palm-fringed shoreline a vivid green with every passing hour. Like all of Kerala’s backwaters, the roots of Vembanad Lake lie in the distant Western Ghats that tower over the state’s eastern edge. The range give rise to some 40 rivers and countless rivulets of very different sizes which make their way to the Arabian Sea. Five such rivers—Achenkovil, Pamba, Manimala and the eponymous Vembanad—drain into this huge lake, and between them, make up the approximately 1,500 sq km Vembanad Wetland System. Since the 90s, tourism has boomed on the lake and its attendant waterways in the shape of houseboats, or kettuvallam, as they’re called locally. These boats, once a mainstay of the waterbased spice trade, are a huge hit with tourists, drawing thousands each year. It was only a matter of time before luxury houseboats made their appearance and sure enough, two of the best have made the lake their base—the Oberoi Hotels’ Motor Vessel Vrinda and Park Hotels’ MV Apsara. My stay was divided between these two cruiseboats, with the first stop being the Apsara. It is the younger of the two, launched in January this year, and yet to complete its first full season. 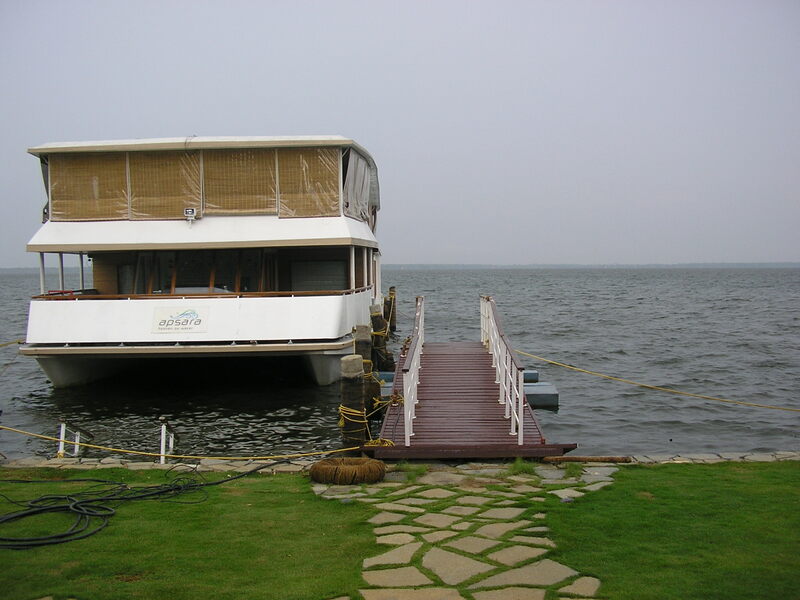 Tastefully designed with clean minimalist lines, it is a smart and relaxed way to see the lake and the backwaters. Although the boat has a four-day cruise itinerary, I was there for only two days, so we made up the itinerary as we went along, under the enthusiastic guidance of the boat’s Operations Manager Pravish Kuttickat. Cruising on the lake, watching the clouds change shape over the massive domed sky as they drifted towards the sea was therapy enough for my battered city soul, but the Apsara also has a fully fledged spa on board, run by Aura. Unlike other cruiseboats that only have a docking station on land, the Apsara’s station is also a fully-fledged resort with 10 luxury rooms, as well as a large fine dining restaurant and a jetty bar. That Kerala has a wet, humid climate is well known, but nothing prepared me for the sight of the storm clouds which arrive like clockwork every evening. I was awestruck by this display, but used to the splendour, the locals did not bat an eyelid. However, the building storm caused us to start back for the safety of the jetty. Although the deepest point in the lake is a mere 12 feet, its sheer size, choppy waters and high wind speeds make it unsafe at such times. The storm broke early, so we made our way to Marari beach 15 km away. Sunsets on the west coast are always a treat, but today, under a light drizzle, the sea turned golden, and the distant thunder-heads glowed a deep pink. 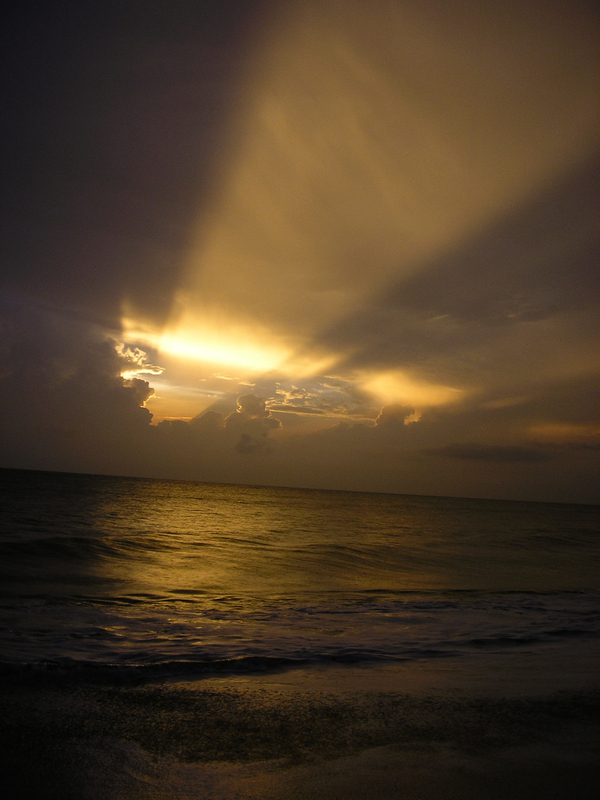 The setting sun and massed clouds conspired to turn the western sky into a massive projector with a quarter-rainbow at its end. Tourism literature labels Kerala, God’s Own Country, and with sights like these, it’s difficult to disagree with the purple prose. But witnessing the unique lifestyle on the waterways had to wait another day, when I was sailing on the Oberoi’s Motor Vessel Vrinda. Commissioned in 2003, and a veteran of the lake since 2004, Vrinda has a solid six years of experience under its belt, and it shows. Manned by a young, enthusiastic crew under the supervision of Chef Simran Singh, the crew never puts a foot wrong, with ready smiles and the discreet service that’s the hallmark of the Oberoi. The boat is opulent eight king-size cabins with large bay windows, and a luxuriously appointed upper deck with a massive dining space taking up pride of place in the middle. The real winner, in my opinion, is the Vrinda’s itinerary. I was able to get my first taste of the backwaters as she set sail southward down the main channel of the lake, heading for the Pamba river and the main Alappuzha canal. Also known as Alleppey, Alappuzha district is famous for several things—from its intricate network of inland canals to its vast Kuttanad rice growing region where much of the farming takes place on reclaimed land below sea level. This has historically been one of the more prosperous parts of the state, fuelled first by the riverside spice trade for which it was famous in ancient and medieval times, and now in its modern avatar, as the rice bowl of Kerala. The main channel of the Pamba river winds south-east, with myriad smaller canals, natural and man-made, branching off in various directions. The main canals are always busy, with houseboats jostling with public ferries, little farmers’ canoes and ducks out for a midday meal. As the Vrinda coaxed and cajoled her way through the traffic, we moved into a smaller ‘rice-boat’ to navigate the narrower channels further in. 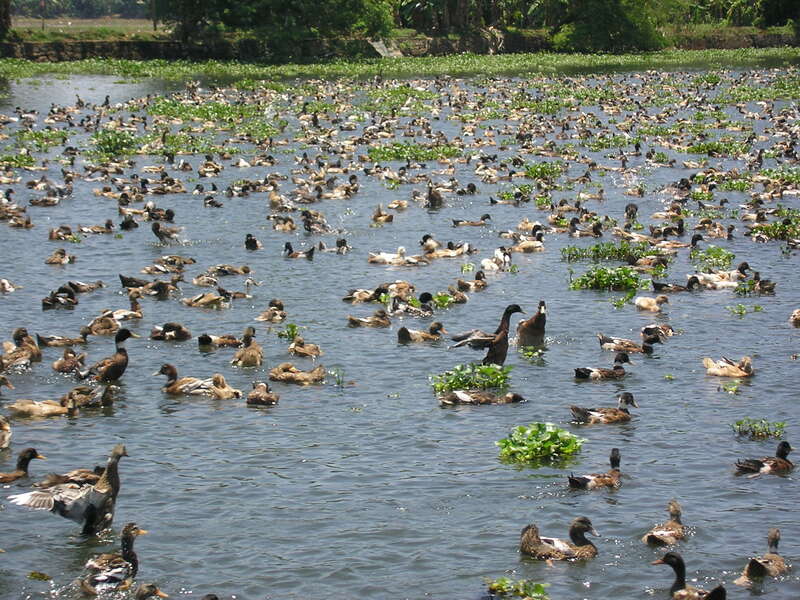 Ducks out for a mid-day meal on the Pemba. Picture by Bibek Bhattacharya. Our destination was the historic inland town of Champakullam on the tributary of the same name. Kerala’s old spice trade used to pass through this town en route to Cochin and other ports on the west coast. Settled more than a 1,000 years ago by Syrian Christian traders, who later converted to Roman Catholicism under the Portuguese, the people chose to keep their syncretic cultural heritage. This can be seen in the monumental St Mary’s Church on the riverside. Built in 1550, the foundations are said to be as old as 8th century AD. Architecturally, it is a mélange of several European styles, from the Levantine altar and structure to the Dutch arches that tower overhead. 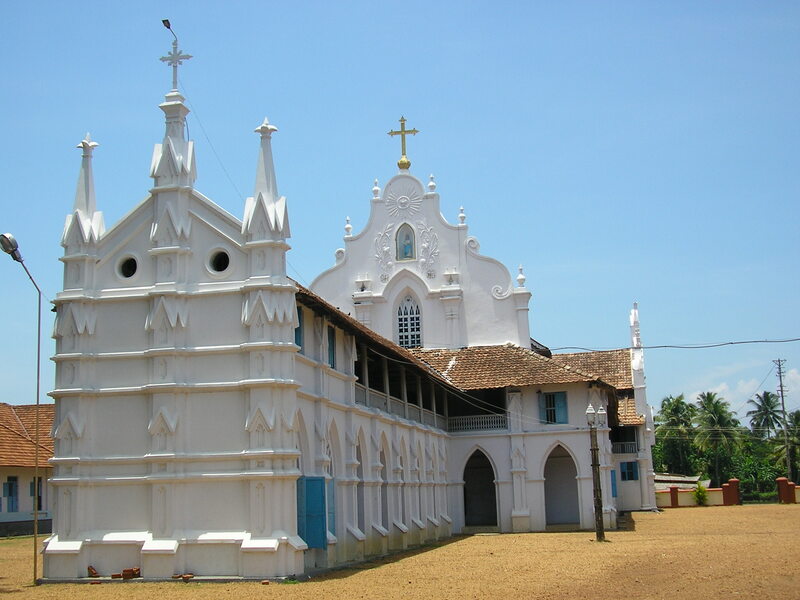 St Mary's church in Champakullam. Picture by Bibek Bhattacharya. The town is famous for the Champakullam Moolam, which is the biggest Vallam Kalli or boat race in Kerala. Held during the harvest festival of Onam in autumn, the Chundan Vallam or snake boat race features 130 ft long canoes called Chundans. Once the maritime warboats of choice, these seat upwards of 100 rowers. 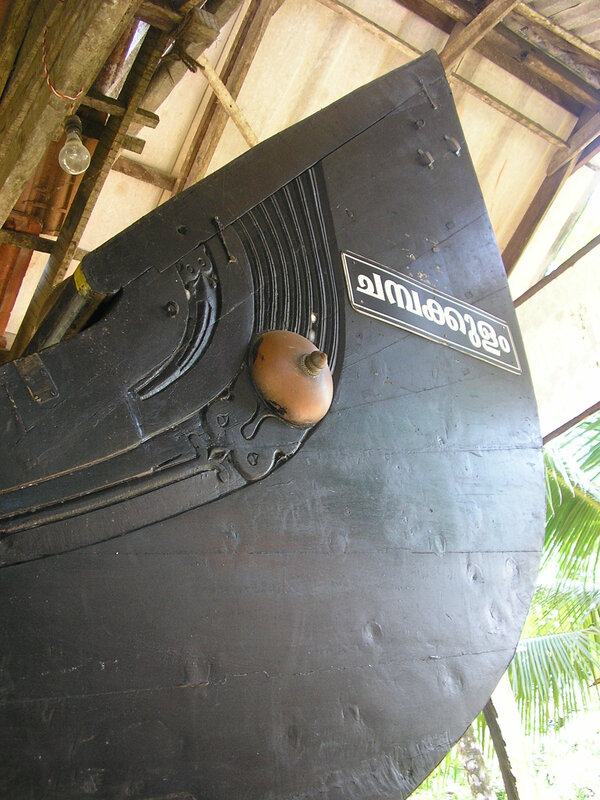 The Champakullam Chundan is the Diego Maradona of boats, built in 1974, and still winning trophies. A visit to the workshop leaves me in complete awe, especially when I find out that these monsters are rolled out onto the river over palm leaves! The head-prow of the mighty Champakullam Chundan. Picture by Bibek Bhattacharya. All this sightseeing is hot work under the humid noon-day sun. A return to the Vrinda is bliss, greeted by cool towels, a tall glass of watermelon juice, and a sumptuous lunch of the choicest Kerala cuisine. Later, on our way back to the jetty, the daily storm catches us full-fury in the middle of the lake, with high whitecapped waves and low ominous clouds. The rain lashes the boat fiercely, but as usual, no one bats an eyelid, the captain steps on the throttle, and soon we are docking under a calm sunset. These cruises are a great way to see the backwaters, especially if you’re a first-timer and the kind of traveller who likes to keep a fair balance between sybarite and explorer. 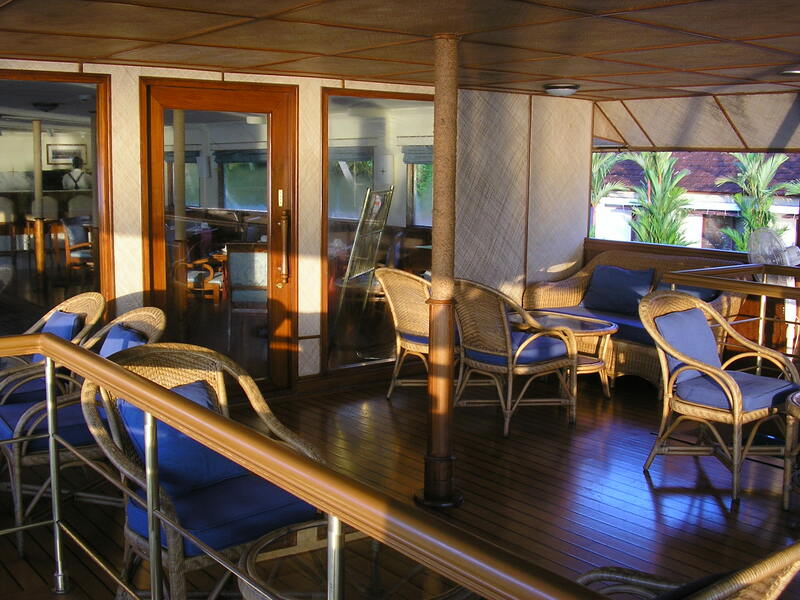 The Vrinda is the seasoned old hand, beautifully laid out with all the luxuries you could hope for and more. The Apsara is newer, but thanks to its lakeside resort and largely informal ambience, it has definite advantages. But as I take a long and exhausting flight back to the traffic-choked city, what lingers in my mind is the memory of this gorgeous verdant land. Where did u get the 12ft figure? Someone told me it was 30ft deep. ( not that I would have jumped into it anyway ) i missed the duck pond. Damn! Hey, got it from a lot of people, including fishermen. They insist its true. Although it does look pretty impressive in a storm! oh very nice. like a breath of fresh air (blowing across a lake ? :) after a chaotic, horribly urban day at work. Nice pics too.